Winamp is more than just a player. It’s your window to the multimedia world. From MP3s to streaming video, Winamp is the one place you go to feed your audio/video habit. · Winamp can use both Modern and Classic skins, so you can be both hip and retro at the same time. · Winamp can play a huge variety of audio and video formats right out of the box… err… out of the installation. · You get access to hundreds of free audio and video channels in the Media Library. This ain’t your father’s library. · Winamp can burn your music to CDs. 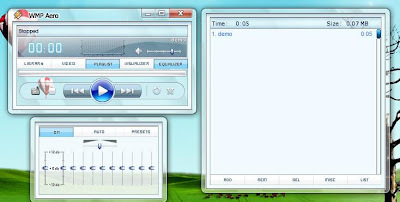 · Winamp makes it easy to create and manage your favorite songs through playlists. Yes, you can be your own DJ. · Winamp allows you to extend it’s functionality through the use of “plug-ins” Its like the Mr. Potato Head of music. · Winamp will allow you to alter the sound of your music through a built-in Equalizer. An audio receiver right on your PC. · Winamp allows you to watch visual effects that are driven from your music with Visualizations. From flaming fireballs to screaming strobe effects, its all there.